I thought the following snippet from a somewhat edited email I recently wrote in reply to a question about random slopes and what it means that an effect becomes insignificant might be helpful to some. I also took it as an opportunity to updated the procedure I described at https://hlplab.wordpress.com/2009/05/14/random-effect-structure/. As always, comments are welcome. What I am writing below are just suggestions. […] an insignificant effect in an (1 + factor|subj) model means that, after controlling for random by-subject variation in the slope/effect of factor, you find no (by-convention-significant) evidence for the effect. Like you suggest, this is due to the fact that there is between-subject variability in the slope that is sufficiently large to let us call into question the hypothesis that the ‘overall’ slope is significantly different from zero. […] So, what’s the rule of thumb here? If you run any of the standard simple designs (2×2, 2×3, 2x2x2,etc.) and you have the psychologist’s luxury of plenty of data (24+item, 24+ subject […]), the full random effect structure is something you should entertain as your starting point. That’s in Clark’s spirit. That’s what F1 and F2 were meant for. […] All of these approaches do not just capture random intercept differences by subject and item. They also aim to capture random slope differences. This entry was posted in Statistics & Methodology, statistics/R and tagged mixed models, R code, random effects, regression. The wikipedia page also gives a nice visual illustration. Here’s my own version of it. The plot shows 15 groups, each with 20 data points. 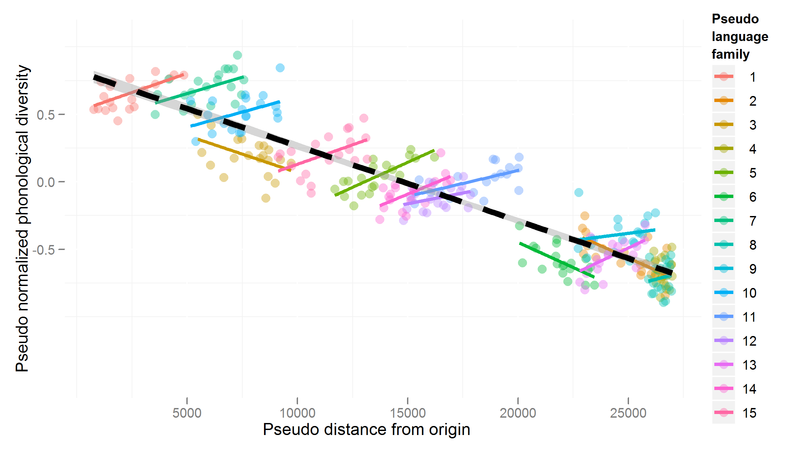 The groups happen to order along the x-axis (“Pseudo distance from origin”) in a way that suggests a negative trend of the Pseudo distance from origin against the outcome (“Pseudo normalized phonological diversity”). However, this trend does not hold within groups. As a matter of fact, in this particular sample, most groups show the opposite of the global trend (10 out of 15 within-group slopes are clearly positive). If this data set is analyzed by an ordinary linear regression (which does not have access to the grouping structure), the result will be a significant negative slope for the Pseudo distance from origin. So, I got curious: what about linear mixed models? This entry was posted in Statistics & Methodology, statistics/R and tagged mixed models, R code, regression, Simpson's paradox, simulation. Last week (02/3-5/10), I had the pleasure to give the inaugural CLS Graduate Student Young Scientist Colloquium (“An information theoretic perspective on language production”) at the Center for Language Science at Penn State (State College). I also gave two 3h-lectures on regression and mixed models. The slides for Day 1 introduce linear regression, generalized linear models, and generalized linear mixed models. I am using example analyses of real psycholinguistic data sets from Harald Baayen’s languageR library (freely available through the free stats package R). The slides for Day 2 go through problems and solutions for regression models. For more information have a look at the online lectures available via the HLP lab wiki. I’ve uploaded the pdf slides and an R script. There also might be a pod cast available at some point. Feedback welcome. I’ll be giving a similar workshop at McGill in May, so watch for more materials. This entry was posted in class/tutorial, For students, Statistics & Methodology, statistics/R and tagged linear mixed models, mixed logit model, mixed models, R code, regression.